Charles Scerri - MFA Player of the Year in 1989. Charles Scerri was born on May 29, 1964 at Qormi. He had his first taste of Premier League football with Floriana FC in 1980 but he did not really establish himself until he joined Rabat Ajax in 1983. Scerri stayed with Floriana for only three seasons. His potential was there for all to see but for some reason the Greens were not ready to give him a permanent place in their squad. On his part, Scerri was not prepared to wait for his chance so, when Rabat made overtures for his signature he decided to take his chance with the Magpies. It was a wise decision for the ambitious youngster. His move finally established his growing reputation as one of the best midfielders on the island. His teaming up with Carmel Busuttil bore rich fruit and in 1984-85 Rabat won the championship and the Euro Cup. Yet, despite the success Scerri was enjoying at Rabat, the next season he signed on the dotted line for Sliema Wanderers. It was a mistake and it did not take Scerri long to realise it. In those days, the Blues were making a return to the top flight after a stay of one season in the First Division. The Wanderers were in the process of team-building and they were surely not geared up to win honours. This did not meet with Scerri's ambitions and in 1986-87 he moved to Hibernians. It was at Paola that Scerri reached his full potential. It was not long before his intelligent play in midfield and his knack to score vital goals made him the idol of the Paola supporters. He played his first match for the national team on October 12, 1985 against Portugal and from then on, barring injury, he became an automatic choice. Scerri went on to win 65 caps before he retired from the national team in 1994. In 1988-89, he capped an excellent season with the Footballer of the Year award. His best period with Hibs, however, was between 1993 and 1995 when he formed part of Brian Talbot's team that won two successive championships. In 1998, he scored one of Hibs' two goals in the final of the FA Trophy against Valletta. This event always seems to elude Hibernians. Eighteen long years had passed since their last success in this competition. Since then, they had only reached the final once, in 1997, when they lost 2-1 to Valletta. Many of the supporters did not even remember the great 1980 Hibs side which had completed their first, and so far, only league and cup double. Therefore, when Hibs reached the final in 1998 for the second year running, there were great expectations in Paola. Hibs beat Rabat 3-1 in the first round and Xgħajra Tornadoes 4-0 in the second before meeting Tarxien Rainbows in the quarter-finals. Hibs triumphed in the derby (4-1) without expending much energy. Then they disposed of Marsa 2-0 in the semi-finals. The final, the second in succession between Hibs and Valletta, never reached great heights. The game only came to life after the resumption when Scerri broke the deadlock. From that point on, Hibs held the upper hand. Eighteen minutes later, they doubled their lead and then controlled the Citizens' expected reaction. Valletta reduced the arrears in the closing minutes but this was not enough to prevent the Paolites from winning the FA Trophy for the sixth time in their history. At last, Scerri had won his last remaining major honour. 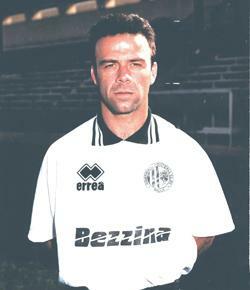 Scerri's career with Hibernians came to an end in 2000 after playing a record 222 league matches for the club. He gave his best days to the Paolites and the supporters showed their appreciation with a standing ovation when he turned out in the colours of Ħamrun Spartans against his old team-mates. Scerri's stay with Ħamrun was short but eventful. In 1999-00, he scored five important goals from nine matches to help his new club win the First Division championship and promotion to the Premier League. In 2000-01, he joined his home town club Qormi but by now his best days were over and after only one season he joined Luxol before quitting the game. Scerri was one of the best attacking midfielders of the past two decades or so. His excellent control and fine dribbling made him a great favourite with the crowds. He was also a dedicated professional who rarely, if ever, missed a training session with club or country. His integrity and sportsmanship was also beyond reproach and his serious approach to the game makes him an excellent model to the youngsters he coaches at Ta' Qali nowadays.